Some people age faster than others, but the discovery of a DNA body clock by UCLA researchers now shows that different parts of our bodies age faster than others. The discovery offers important insights into the aging process — and what we might be able to do about it. This isn’t the first time that biologists have developed a mechanism for assessing age. Earlier “biological clocks” have been derived from data drawn from saliva and hormones. More crucially, there are our telomeres to consider — those fraying tips of our chromosomes that have been linked to cellular expiry dates, and by virtue, our individual rates of aging. But the new research, which was conducted by Steve Horvath, a professor of human genetics at the David Geffen School of Medicine at UCLA and of biostatistics at the UCLA Fielding School of Public Health, is the first to show an internal clock able to accurately assess the age of various human organs, tissues, and cell types. And remarkably, certain parts appear to age faster than others. 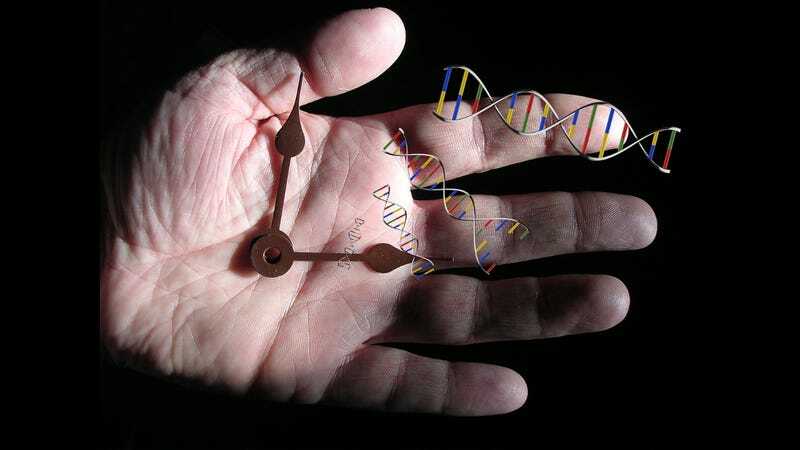 To create the clock, Horvath studied DNA methylation, a naturally occurring process that chemically alters DNA. And indeed, scientists are increasingly learning that many manifestations of aging are caused by epigenetic factors — those changes to our DNA that happen after we’re born. As an epigenetic process, methylation is a crucial component of normal development and cellular differentiation. It can suppress the expression of viral genes and other biological nonsense that accumulates over time. Regrettably, it also plays a crucial role in aging and the development of nearly all types of cancer. For the study, Horvath looked at 121 different sets of methylation-specific data, including 8,000 samples of 51 types of tissue and cells taken throughout the body. He took this information and charted how age affects DNA methylation levels from pre-birth all the way up to 101 years. The resulting DNA clock, which is essentially a statistical model, was compiled by honing in on the 353 markers that change with age and are present in our bodies. While testing the clock, Horvath compared various tissues’ chronological age with its biological age — which repeatedly proved accurate. Indeed, what he discovered was a bit shocking. For the most part, the chronological age of our body parts matches its biological age. But there are some exceptions, including female breast tissue. He also discovered that tumor tissues are an average 36 years “older” than healthy tissue — an important piece of insight that could explain why age is such an important risk factor for many cancers in both sexes. He also found that some brain cancer tissues taken from children had a biological age of more than 80 years. The research also showed that our clocks speed up and slow down depending on our age. It ticks along much faster when we’re born and growing from children into teenagers, but then it slows and settles at a constant rate by the time we reach our twenties. Fascinatingly, the research also shows that stem cells are virtual “newborns.” Horvath believes that the process of transforming a person’s cells into pluripotent stem cells could rewind and reset our cells’ clock to zero. If true, this could lead to novel anti-aging therapies. But the question now confronting scientists is whether the biological clock controls a process that leads to aging (Horvath’s finding is largely correlational). If yes, Horvath’s clock could become an important biomarker for studying new therapeutic approaches to keeping us young. Future therapies could take the form of drugs and other interventions. We’ll also be able to compare the ages of different tissues and organs in the same individual; this will have huge implications for disease diagnosis and the development of highly individualized treatments. Indeed, the breakthrough could have wide-ranging implications in aging and anti-aging research. But while Horvath enthusiastically says that “It could help us to finally understand why we age,” it’s fairly obvious to most that the aging problem is a tremendously multifaceted one. The development of a DNA clock is clearly important, but one of many, many different breakthroughs and insights that will ultimately lead us to a state of medically induced negligible senescence.